Fourth of July celebrations (and decorations) are the best! 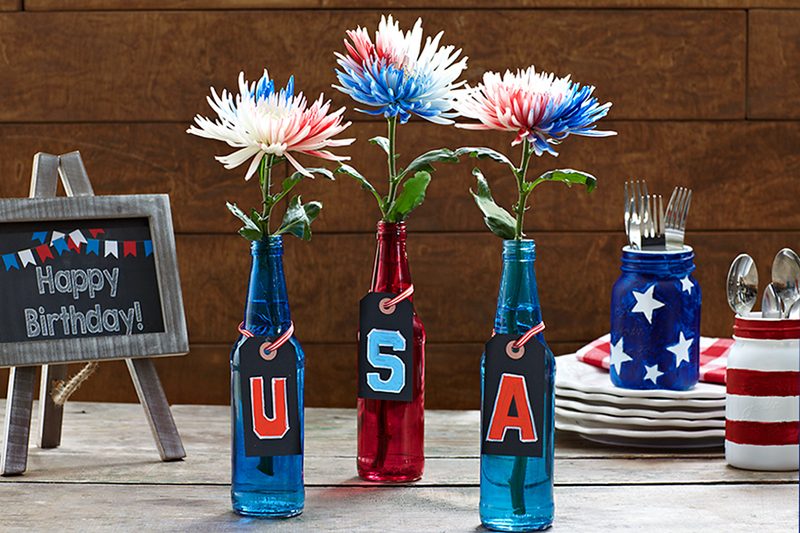 Whether you’re celebrating America’s birthday with friends and family on the beach or in your backyard, here are some easy ways to add little patriotic touches of red, white and blue with these fun DIY floral 4th of July decoration ideas! Seriously, is there anything you can’t do with a few mason jars? I took three small, clear mason jars and painted them in a stars and stripes tribute to Old Glory. One stem of blue hydrangea in each and you have a beautiful, fun, inexpensive centerpiece. You could paint a couple more while you’re at it and use them to hold cutlery or straws, or even tea lights, creating a festive look for evening festivities. In a well-ventilated space spray paint ONLY the OUTSIDE of your mason jars and let dry thoroughly. Using a pencil, draw stars all around the outside of one of the mason jars. You can do this free hand or make a template with a piece of paper first. Paint the rest of the mason jar around the stars with blue paint. Remember, this is not a fine arts project – it’s a craft project and imperfections should be embraced! Use rubber bands to create guidelines for painting red stripes on the other two mason jars. As soon as the paint is dry you can fill with water and add your flowers! U.S.A. all the way! I picked up all three of these blue and red bottles for under $5! The finishing touch is the U.S.A. hangtags that I made using small blackboard hangtags and chalkboard markers. Tie around the neck of the bottle with a thin, coordinating ribbon like the red and white striped one shown here. But what I really love are these firework flowers! Don’t the spider mums look like fireworks exploding in the night sky! You can buy these Red, White & Blue Firework Mums at 1800flowers.com, but if you aren’t able to, red, white, and blue flowers can work just as well. Look how fabulous they look in a simple galvanized French flower pail. What a perfect arrangement for a summer July 4th celebration! Painted flowers have been trending for the last two years or so. There are a few different ways to paint flowers, including stem dying and surface painting. The spider mums are an example of surface painting, and these red, white, and blue roses in the below image are stem dyed. This is an all out, spare no expense WOW of a Fourth of July floral arrangement. As beautiful as the red, white & blue roses, blue hydrangea, and firework spider mums look in this oversized red enamel container, what makes it even more impressive is the mini flag garland! See how to make it below. Glue – 2 sided tape, adhesives tape runner, glue dots, etc. Measure a piece of ribbon to the size that you want and add a few inches extra for each side. Figure out how many flags you will need based on the size that you want them to be. My flags are 1” wide and the length of the ribbon where I will attach the flags is 18,” therefore I need 18 mini paper flags. Glue each flag to the ribbon. It’s best to use a ribbon that is narrow but has enough area to glue the flags to. The ribbon I used is 1/8” wide. To raise the garland above the arrangement, glue the ribbon to heavy gauge wires or wooden skewers. This garland can be made in any size that works for your applications. Just adjust accordingly. If you liked the painted flowers in this post, keep an eye out for my next post which will be all about painting flowers, step-by-step! Making rainbow roses was a lot of fun and is a great summertime activity to do with the kids!